1 See, I am sending my messenger to prepare the way before me, and the Lord whom you seek will suddenly come to his temple. The messenger of the covenant in whom you delight--indeed, he is coming, says the LORD of hosts. 2 But who can endure the day of his coming, and who can stand when he appears? For he is like a refiner's fire and like fullers' soap; 3 he will sit as a refiner and purifier of silver, and he will purify the descendants of Levi and refine them like gold and silver, until they present offerings to the LORD in righteousness. 4 Then the offering of Judah and Jerusalem will be pleasing to the LORD as in the days of old and as in former years. 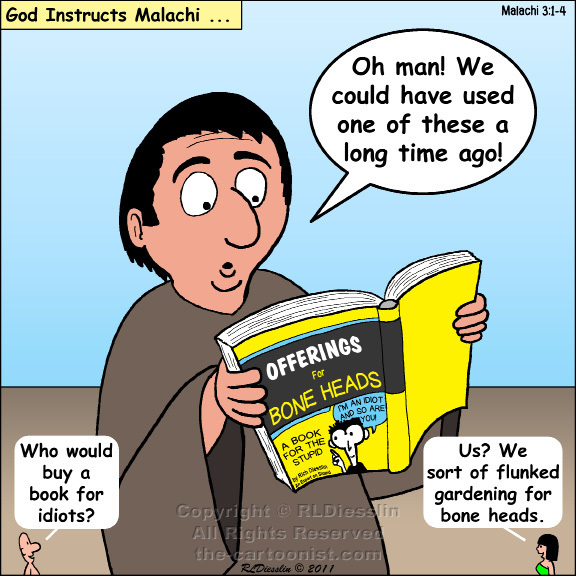 Malachi 3:1-4 comes at the end of a long argument between God and the people about God's justice. In the context with this and the post-exilic period in general, Malachi's message is about a messenger who will purify the temple priests and restore worship to it's rightful role. The refining process for metals is used elsewhere in the Old Testament (e.g. Jeremiah 9:7 and Zechariah 13:9) as an analogy for purification. The Christian tradition has also interpreted it messianically with the messenger either being John the Baptist (Mark 1:2 combines this text with Isaiah 40:3 to introduce John the Baptist) or Jesus, hence its use as an Advent reading. In the process prophesying, Malachi comes very close to discovering the formula for a line of best selling self-help books.